I’ve been in the bush for nearly a month. Before starting this trip I had spent at most 4 days in the bush and never alone. It ain’t that bad. The bike riding is the big challenge. This morning I wake up around 5am to ‘water the flowers’ and observe that my camp-fire is dead and coals are barely hot. I throw a few sticks at it and go back to sleep. At 6.30am, my alarm goes off, and to my surprise I can see through the tent that my fire is well alive. It seems I had a very good night, and I’m feeling better than yesterday. Not perfect but that will do. This day Hill climbing is in the back of my mind. The anxiety grows. 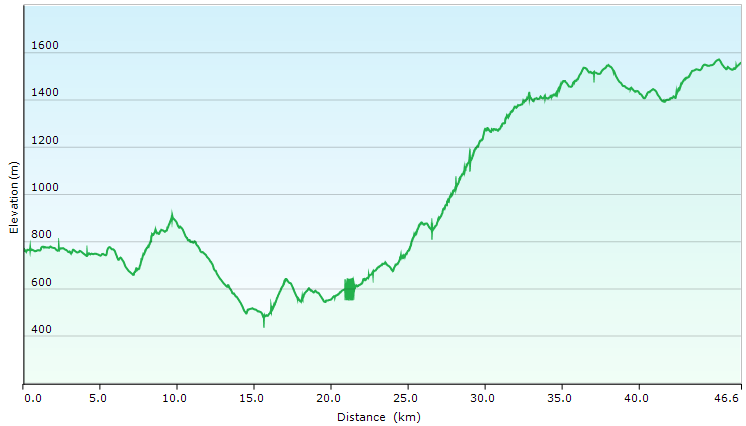 The good news is that this is the last time I spend the entire day climbing uphill. There might be Barrington Tops in NSW and some places in Queensland, but they will be nothing compared to the Victorian Alps. I pack up, and get ready for that last climbing day. It will be unpleasant. Sometimes I day dream of reaching Canberra or even Cooktown. It all seems very much doable now that the worse is behind me. It will a huge victory. Although I’m not quite sure what will be the price for this achievement. As they say, it’s all about the journey, but it sure helps to think on the end goal. Like yesterday, most of the day riding is spent following power lines. It is an annoying ride. By midday I already have enough and I haven’t even started. I just went through undulations, just a warm up. I have to lift my bike up a fence because the owner of this land does not have combination locks for the gate, and so told me to simply lift it up over the fence. Easier said than done, that is a good half an hour delay, time to unload the panniers and other heavy items and put them back into place. The bike weighing near 50kg, it needs to be unloaded before lifting all the way over a barbed wired fence. I take a long lunch break, and a short nap, delaying this coming hard work. I figured if I eat well, I’ll be up for the job. But not today, food is digested just too slowly and does not give me the kick. I really have to find something better than this heavily processed cheese for my wraps. Most of the afternoon is spent pushing the bike on the trail. It is ‘only’ 11% incline so it is rideable. But over 40kms I need to preserve my energy. I worry I won’t make it to the hut before dawn. At last the top, then it’s undulations. The small rocks are annoying, little traction and too much vibration. I swallow all the high energy food I have, including the last apple I get from the farm. The hut is further away than I thought. I make it just in time before its dark. I set up my tent outside and make a fire in the hut. The evening is spent in the hut. It’s warm and almost cosy. Shame I don’t have mobile coverage inside the hut. I’ll have to go for a walk to check my emails. Once again the high country is splendid. I love it. It’s quiet and beautiful. Tomorrow I will reach the highest point of the Bicentennial National Trail at 1,700m. I have all the reasons to celebrate. Finally, I made it. Soon I’ll be flying down the hills towards Canberra and soon after it will be Sydney. But before that I’m spending the Easter weekend in the mountains with my friend. I will be able to say goodbye to the mountains and find peace with them. Beautiful but unforgiving mountains. I’ve sweated at them at time, and they didn’t mind. But I needed it. Tears came too. I’m ok with that, it was worth it.